Caution — wide load: Juan Berenguer was a little too, um, girthy to fill the narrowed vertical frame in Fleer's 1992 set. How could Fleer have better used the space at the top of this photo? Detail shot of Berenguer's bulge. A better card design. For Christ's sake. I was in Panama on vacation one year, and I started chatting with one of my cab drivers about baseball. I was asking him about Panamanian baseball players in the majors (expecting him to talk about Rod Carew) and all he talked about for 25 minutes was Juan Berenguer. At the time I'd never heard of him, so I kept saying things like "Are you sure you don't mean Mariano Rivera? ", but he was adamant about Juan Berenguer...I don't think he'd even heard of anyone else. Awesome story. I gotta imagine Berenguer is the Panamanian David Wells. Blue-collar hero. 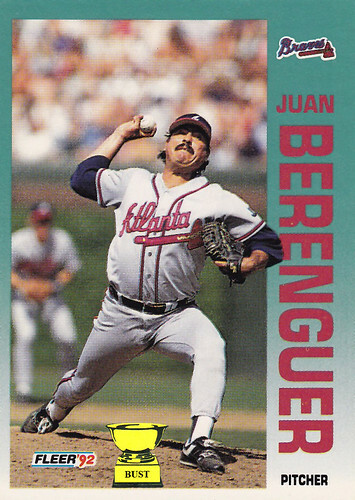 Is Juan Berenguer only 3 feet tall, or is that just terrible cropping on the part of Fleer.